A new survey of US military personnel finds presumptive Republican nominee Donald Trump leading his Democratic opponent Hillary Clinton by over a 2-to-1 margin. Sputnik relays a Russian analysis on why this may be the case, and it's probably not what you think. Eccentric business magnate Donald Trump skyrocketed his way to becoming the presumptive nominee of the Republican Party earlier this month after his win in Indiana, when his remaining opponents dropped out of the race. And while his poll numbers against Hillary Clinton, the leading candidate among the Democrats, generally remain slanted against him in head-to-head polling, that's not the case among US military personnel. In polling of 951 verified active-duty troops, reservists and National Guardsmen, The Military Times found that in a matchup between Trump and Clinton, 54% of respondents said they would support the business mogul-turned-candidate, compared to 25% who chose the former secretary of state (the remaining 21% said they would not vote). At the same time, when the matchup was switched to Trump vs. Senator Bernie Sanders, Trump got 51% support, compared to 38% for the Vermont senator. Among the four branches of the US Armed Forces, the Army, the Navy, the Air Force and the Marine Corps, Trump trounced Clinton 56-24%, 48-31%, 54-25% and 60-18%, respectively. — Bill Badey (@10903) 10 мая 2016 г. ​The Military Times also recalled that military personnel had shown a similar preference for Trump in polling conducted in March, with Trump the leader among the six presidential candidates who remained, and the clear leader among his Republican opponents. 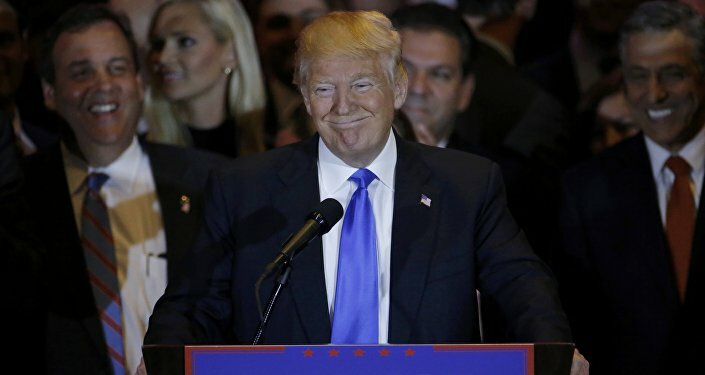 With Russian analysts and much of the public watching the US presidential campaign almost as closely as Americans themselves, independent online newspaper Svobodnaya Pressa attempted to explain the landslide in Trump's favor, turning to Sergei Bespalov, a senior researcher at the Russian Presidential Academy of National Economy and Public Administration, for possible answers. The biggest reason for the military's support for Trump, Bespalov suggested, is Trump's rhetoric on foreign policy. "Trump's promises to significantly temper the military activity of the United States around the globe very likely brings forth a positive reaction from the military. They are, in general, not too thrilled about the idea of their country being dragged into new armed conflicts, since they are the ones who take most of the risks" when this happens. "At the same time," the analyst says, "Clinton has a reputation for being a supporter of a very aggressive foreign policy, connected to the continuation of the current policy of the forced expansion of 'Western-style democracy' throughout the world, and for active intervention in the internal affairs of a host of countries and regimes which Washington finds undesirable. This, of course, is fraught with the danger of the intensification of the use of the US armed forces abroad, and for new military conflicts." Asked by the newspaper why the Pentagon would prefer Trump and his non-interventionism, Bespalov corrected his interviewer. "It's not the Pentagon that prefers Trump, and not the military elite, but the majority of ordinary servicemen and women. The Pentagon supports Clinton. But those soldiers who, in the case of a Clinton victory, will be drawn into new conflicts, and will have to risk their lives, clearly aren’t thrilled about this prospect. And therefore among ordinary soldiers and officers Trump has proven to be more popular." Mikhail Alexandrov, a senior expert at the Center for Military-Political Studies at the Moscow State Institute of International Relations, suggests that other reasons may be at play. "Trump shows resolve in the use of force. He demands that Obama use force, including in Syria. He is prepared to aggravate relations with Iran. He says that dialogue with Russia can come only 'from a position of strength'. And recently he said that it would be necessary to shoot down Russian planes, referring to the recent incident involving the American destroyer Donald cook and our fighters." "Trump, in his rhetoric at least, is creating an image of an aggressive macho, who is willing to use force when, in his view, American interests are threatened. This approach appeals to the military." In other words, Alexandrov suggests, Trump "is a supporter of a more open policy of the use of force, unlike Clinton, who prefers methods of hybrid warfare, including 'soft power' and special operations. Trump is ready to use [military] force directly, decisively, and on a large scale." Which approach is preferable for Russia, and for other countries looking to escape US hegemony and create a multipolar world, remains to be seen. Moscow has already had a taste of the approach proposed by Mrs. Clinton, which includes more color revolutions on Russia's borders, and endless wars in the Middle East. Trump, at the very least, has talked about negotiating with Moscow, and has criticized Clinton, Obama and George W. Bush for the disastrous military interventions over the last fifteen years which cost thousands of American servicemen and women, along with hundreds of thousands of people in the Middle East their lives. Whither Globalism: What's Behind the Rebirth of Nationalism in the West?